There's a crate in Venice, Italy, that contains a vision of the future for a city that needs one. And two professors at the Rice School of Architecture are anxious to see it opened. The crate contains their impressive 4-by-5-by-8-foot wooden model of a towering mixed-use structure designed to transform Detroit. It's part of a proposed strategy to bring a run-down industrial neighborhood back to life and awaits installation as the Rice University team's entry in the 15th International Architecture Exhibition at the Venice Biennale. If they could, Albert Pope, Rice's Gus Sessions Wortham Professor of Architecture, and Jesús Vassallo, an assistant professor of architecture, would turn the model into a timber-constructed reality to address what they see as the oncoming necessity of providing a more carbon-friendly built environment. Pope and Vassallo were among more than 250 United States architects or teams who competed for 12 spots in the American pavilion at the prestigious exhibition. The Rice duo responded with a yearlong effort to design the complex for two blocks in Detroit's Corktown, which they described as an industrial neighborhood in a city where much of the industry is gone. They also went above and beyond their assignment by considering the long-term implications of redevelopment for the entire 250-block Corktown neighborhood. 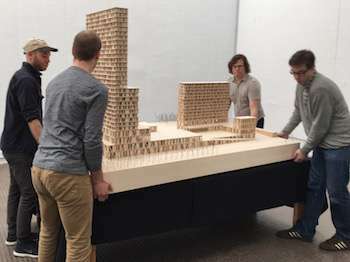 The model designed and built at Rice by Pope, Vassallo and their students during a fall seminar will be among the dozen Corktown exhibits patrons will experience in Venice from May 28 to Nov. 27. The professors and a Rice graduate student, Daniel Kuehn, will be present for the opening, glue guns in hand. "We prepared a small suitcase with replacement parts, just in case we get to Venice and find we have to do some quick touch-ups," Vassallo said. That should be the easy part, because they made the model tough enough to withstand its ocean voyage. The hard part entailed months of study into how next-generation cities tie into the planet's carbon cycle. Pope maintains that urban planners must take into account the drastic cuts in energy consumption that will be necessary over the next 50 years. "As we move into the future, it gets more important to cut our energy consumption," Pope said. "We're anticipating that older parts of the city will be sites for new density and new development that will effectively cut consumption by 70 percent." He's not just thinking about Detroit. A theme in Pope's work is that the roots of the future exist today and that the current state of any neighborhood "inevitably will inform its evolution," a concept dubbed "Present Future." He has been applying the same strategy to a proposal for Houston's Fifth Ward in collaboration with Rice's Shell Center for Sustainability. "There is a well-known urban theorist, Aldo Rossi, who said the most important, most permanent part of the city is the plan, which is manifest in the first 4 inches above the ground," Pope said. "The plan locks in the land ownership, the public street network, utility runs and a slew of associated functions. Buildings come and go, but it is the plan that has staying power. "That's one of the things Detroit and the Fifth Ward have going for them," he said. "They have existing urban infrastructure and a public matrix of streets and blocks that have enormous potential in the future. But because it's more or less invisible (from ground level), people don't appreciate its potential." The professors visited Corktown and talked to residents and city officials last year. They found what once was a small Irish enclave in the city became, in the 1950s, a larger urban landscape locked in by highways and the Detroit River. Vassallo noted the original neighborhood had 54 roadway connections to other parts of the city. After years of highway construction, 10 remain. Envisioning the transition from Corktown to what they are calling New Corktown over the next 50 years, Pope and Vassallo see the neighborhood's landlocked nature as an opportunity to grow up, not out. 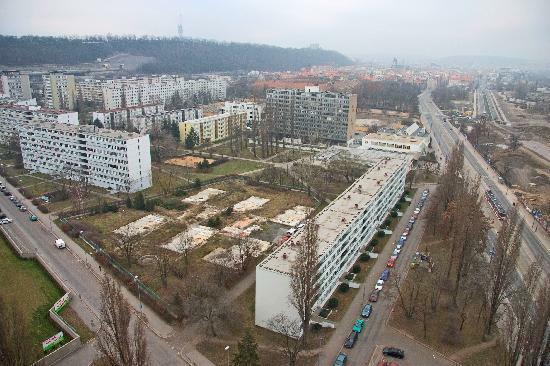 Their master plan, presented in 10-year increments, would have the neighborhood's density increase tenfold and also incorporate forested carbon sinks – five-block-wide "plantations" set at regular intervals to keep residents close to nature no matter where they live. The architects received guidance from foresters at the Rice Land Lumber Co., an extensive Louisiana tree farm owned by Rice for more than 100 years. "The most environmentally efficient city in the United States at this moment is Manhattan because of the lower footprint, the bigger buildings and the fact people don't have cars and don't need cars," Pope noted. Taking cars out of Motor City may seem unrealistic, but increased density would encourage the development of more efficient mass transportation that Detroit now lacks, he said. The professors see their proposed waterfront structure as a gateway destination for the neighborhood. It features a 40-story residential tower, a hotel, a conference center and an outdoor performance space facing a river walk that is already under development. The design is made primarily of renewable wood. "We're trying to create an environment where a person can visualize and be aware of the need to synchronize our rhythms of consumption and production with the actual rhythms of what the land can provide," Vassallo said. "The trees operate as buffers, a way to make sure there's open space at the scale of the new construction." Pope said the extensive use of wood composites as basic construction materials is a trend that hasn't been fully exploited – and needs to be. "We are anticipating the development of carbon pricing, which will change the economics of development," he said. Carbon pricing is considered by many to be a tax that emitters will be charged for each ton of carbon released to the atmosphere. Pope explained that such pricing will make steel and concrete prohibitively expensive. "It's not obvious to many people that a carbon market is coming. To us, it's very obvious, and there's no way around it. "One of the things it means is that wood is going to be the cheapest material you can use. There are fewer carbon emissions, and it's the most efficient material you can build with," he said. "We're trying to see the potential in building efficient environments based on density. "Trying to combine all those things with a coherent planning strategy for the area has been our ambition for the project," Pope said. After Venice, the Rice exhibition, which received support from former Rice trustee Raymond '55 and Susan Brochstein, will travel to the Museum of Contemporary Art Detroit, along with others in the American pavilion. "That's going to be the most interesting part of this whole experiment," Vassallo said. "These projects have been produced for an international audience of people who go to the Biennale, very forward-thinking architects. It'll be interesting to gauge the reaction from this group. But it's going to be even more interesting to see what the local audience in Detroit has to say." I bet a carbon audit would find the use of "wood" is irrelevant to CO2 emissions over the buildings lifetime. Concrete and steel are high CO2 yes wood no--but materials make a minor part of the construction CO2 budget--and in theory a smaller use of a high CO2 material could result in less total CO2 emissions than a larger amount of a low CO2 one. Looks like eco-virtue signalling. 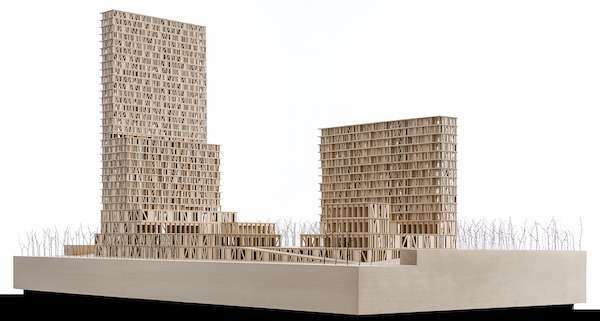 It may be made of wood, and they probably put a lot of effort into the carbon reducing idea...but the model still looks like any soulless residential highrise. And it has the same problem too. It's planned, not organic, so the people have no real reason to live there. Where's the jobs? What are everyone doing there? That's the downfall of all these "projects" which try to cram people into specially constructed "living areas" that end up turning to ghettos. If it were possible to have a city without industry, there wouldn't be any need to re-develop Detroit in the first place. I hope they ensure that all of this extra fuel isn't going to make them more likely to go up like a bonfire in the event of fire. Carbon is irrelevant, in any case. Unless the clathrates suddenly all disassociate.